2. To render an entity grid (that is, to view lists of records and other data): Read privilege on the entity, Read User Settings on the Business Management tab, and Read View on the Customization tab. 3. 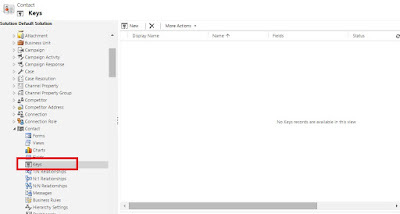 To view single entities in detail: Read privilege on the entity, Read System Form on the Customization tab, Create and Read User Entity UI Settings on the Core Records tab. 1. We can grant security roles to owner teams. 2. Owner Team owns the record, i.e Owner field of each record will be filled with the team. 3. Need to be created manually or programmatically created and managed. 4. 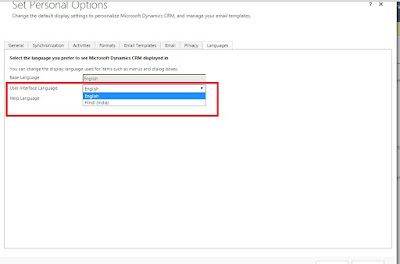 Will be cached in Dynamics CRM Server when user accesses application. 5. Can act as a resource in service scheduling. 1. We cannot grant security roles to access teams. 2. It cannot own any records. 3. Won't be displayed in most team views. Though we are working with the system very closely, certainly there are few things which we might not know. Here I would like to give few important points related to solutions. 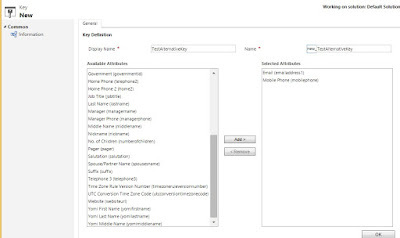 If you import customizations that include a language that is not installed on your system, any labels defined in the customizations will default to the base language of the Microsoft Dynamics CRM system the customizations were imported from. These are very interesting points I came to know when I gone through MS CRM adminstration guide. Please comment if I miss any so that those points will be added to the list. In MS CRM 2016 on-premises and online, fetchXML came up with a new attribute called “page”. Using this attribute we can set which page results we want. 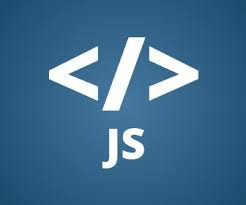 Above query set query for accounts and limit the number of entities to 2 and return just the first page. For CRM versions earlier than CRM Online 2015 Update 1 and CRM 2016 (on-premises), you cannot define the behavior of the date and time values. By default, the date and time values are stored as UserLocal. But in latest version, behavior of date and time field is classified as 3 types. · This behavior always stores the date and time in UTC format. While retrieving, it will returns date and time in UTC format. · When user trying to update date and time, if user enters date in UTC, system will update the value as it is or else it will convert entered date and time into UTC format then stores. · This behavior will stores date only and time will be always stores as 12:00AM (00:00:00). · While retrieving the value also, time will always carries as 12:00AM. · Stores the date and time in system regardless of user time zone. · While updating the date and time also, it will stores date and time what user enters as it is. Date and Time fields generally are meant to store date and time. Did you ever tested, what is the max early date you can give in that field? Now a days, so many applications providing the feature to view their application in user preferred language or region language. MS CRM also provide this feature. Below are the steps to follow to enable the languages. 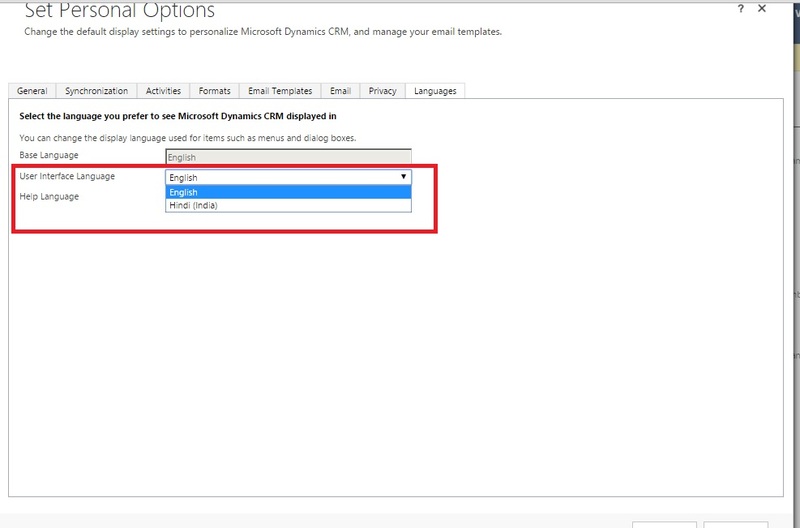 Upon click on languages, one screen(as shown below) will show you the supporting languages by MS CRM. 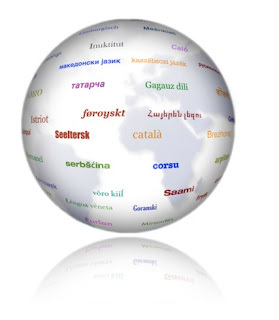 By selecting one of the required language and applying, it will the selected language to user’s preference list. Below are the steps users to follow to change his language. Settings (It is users settings as shown in below screen) - > Options (Click on options)-> Languages -> User Interface Language. If we want to update a record in any entity, we should require GUID. If we know the GUID, we can do it easily, if not, we should retrieve the GUID of that record first, then we can update the record. 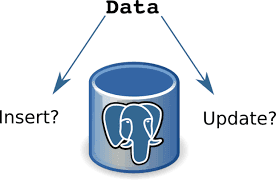 Here, two database calls (Retrieve and Update) we are making which impacts performance of an application. In these scenarios, Upsert will be very useful. Upsert request will check in database whether record exists in database, if exists it will update the record or else it will create the record. So, how do we know that whether Upsert create or update record in each call? This information we can get from UpsertResponse which contains a Boolean property RecordCreated. If RecordCreated contains “true” it indicates Upsert created the record else updated the record. 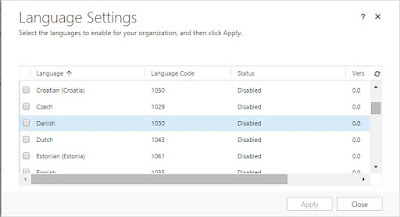 Note: For Microsoft Dynamics CRM Online organizations, this feature is available only if your organization has updated to Dynamics CRM Online 2015 Update 1. 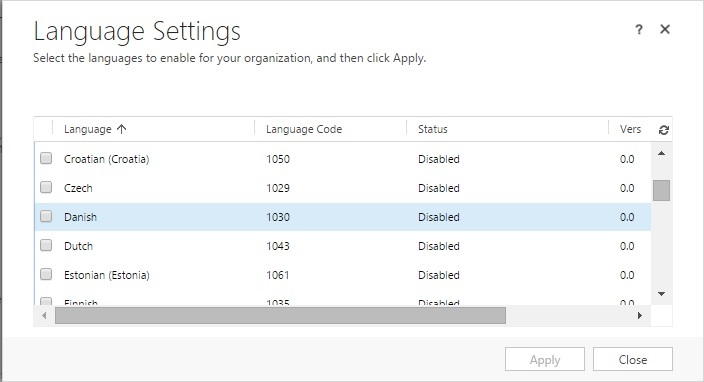 This feature is not available for Dynamics CRM (on-premises). In MS CRM, primary key place very important role in uniquely identifying the records in an entity. 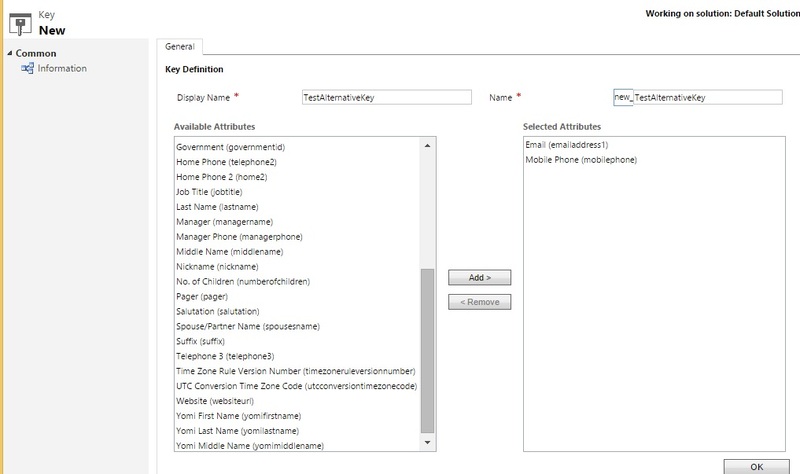 Alternatively, MS CRM introducing new concept called “Alternative Keys” to identify the records. So, we will see more on how to create and use alternative keys. 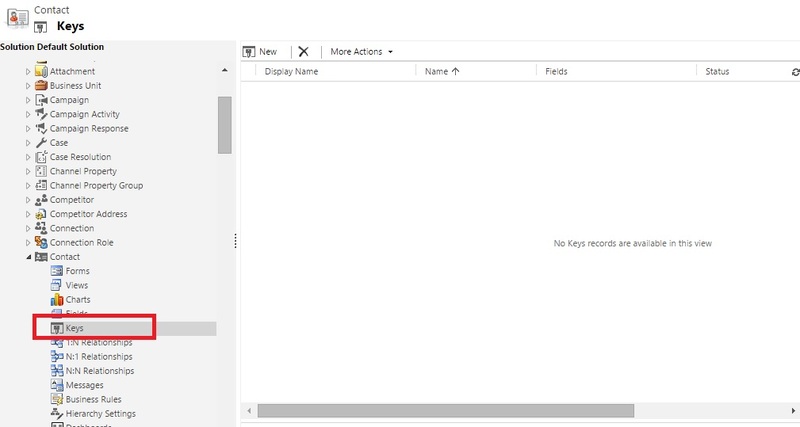 In each entity customizations we have a link called Keys as shown below. On click on New button, below screen will appears. We need to give alternative key name in Display name and have to select one or more attributes from available attributes. You should be aware of the following constraints when creating alternative keys. 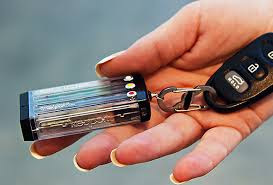 Only, Decimal number, Whole number or Single line of text can be an alternative key. There can be a maximum of 5 alternate key definitions for an entity in a CRM instance. We may have a requirement of, on create of a particular record, we need to update another record... For these kind of requirements, we generally use out of the box workflows. When we have created workflow, and click on "Set Properties", sometimes it will through "Invalid Argument" exception. This exception will not give any other information other than "Invalid Exception". To get more information on exception we need to enable the tracing. To more on how to enable tracing click this link. If you read the trace file carefully, you will find the reason of this issue as “Wrong type of attribute UI properties passed to the attribute "new_fieldname"”. So, we need to remove this field from form, Save and Publish then try to set properties. If there are no other fields which causing this issue, form will open or else you will get "Invalid Argument" exception again, so we need to iterate this process till we remove all issue causing fields. Hope this will helps someone’s time.